Info "These life-forms are causing vibrations in the air. They want you to clone their performance!" Garage Rock is a microgame found in the IQ folder in WarioWare, Inc.: Mega Microgame$!. It is named after the subgenre of rock music known as garage rock. The four-piece band is arranged in a diamond shape, with the location of each member matching a button. The microgame starts with some members playing their instruments in a certain order. The player then must repeat the sequence by pressing the corresponding buttons in the same order. 1st level difficulty: The player must memorize two moves the band plays. 2nd level difficulty: The player must memorize three moves the band plays. 3rd level difficulty: The player must memorize four moves the band plays. 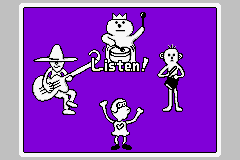 The band in this microgame reappears as a cameo in WarioWare: Touched! at the beginning of Mona's story, as The Pork Loins. They appear as the third-ranked band in the "Ear Candy" TV show. This page was last edited on January 3, 2019, at 12:38.